AITC partners with leading-edge innovators. 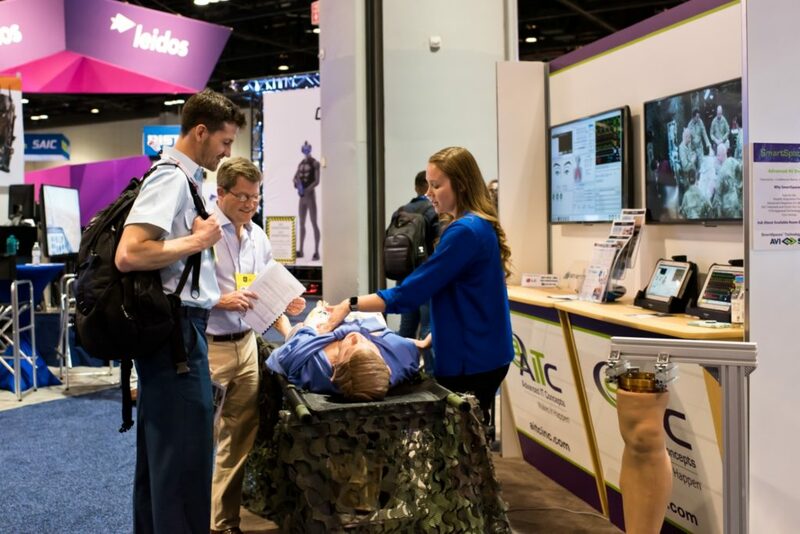 At I/ITSEC 2018, the world’s largest modeling, simulation, and training conference held annually in Orlando, AITC invited SIMETRI, an 8(a) woman-owned, minority-owned, small business located in Winter Park, FL, to present their latest training innovations. SIMETRI has been providing end-to-end solutions for critical training support and works with AITC to provide network engineering and architecture design support. One of SIMETRI’s medical research assistants, Jordan Coulter, explained how SIMETRI’s technologies integrated with others, such as Laerdal manikins, for specific medical procedures and for more inclusive medical training. One of SIMETRI’s anatomical innovations is a leg which can be screwed into a manikin for an amputation procedure. “It has the tubing where you can connect it into their blood system so that it actively bleeds and you can practice for the applications of tourniquet and other clinical procedures,” Coulter explained. With more women joining the military, there’s a growing need to train for casualties which affect women, and that means having an anatomically correct manikin to train on. Usually, most manikins are male by default, but it can be expensive to buy a separate manikin for that purpose. So SIMETRI has a more cost-effective solution – a manikin retrofit kit which can be placed on a manikin, without voiding warranties or limiting the manikin’s capabilities. “You can still do all the procedures, that includes the mask, the vest with the correct female anatomical parts. You can [perform] urinary catherization, needle chest decompressions, etc.” Coulter said. A part of the kit’s innovation is the silicon skin which allows students to perform venipuncture and phlebotomy procedures. It’s quite resilient to puncture wounds, but they aren’t visible. Part task trainers allow medical students to perform specific procedures on various parts of the body. At I/ITSEC, SIMETRI showcased some of these devices. One-part task trainer is for a fasciotomy in a lower leg. This is a surgical procedure where the fascia (connective tissue which covers muscles or internal organs) is cut to alleviate the pressure of a swollen injured muscle or tissue. The common ailment treated by a fasciotomy is called compartment syndrome. By performing a fasciotomy, this can help increase blood flow to the injured muscle and prevent the loss of a limb. SIMETRI’s part task trainer allows a medical student to train on all four compartments of a lower leg. 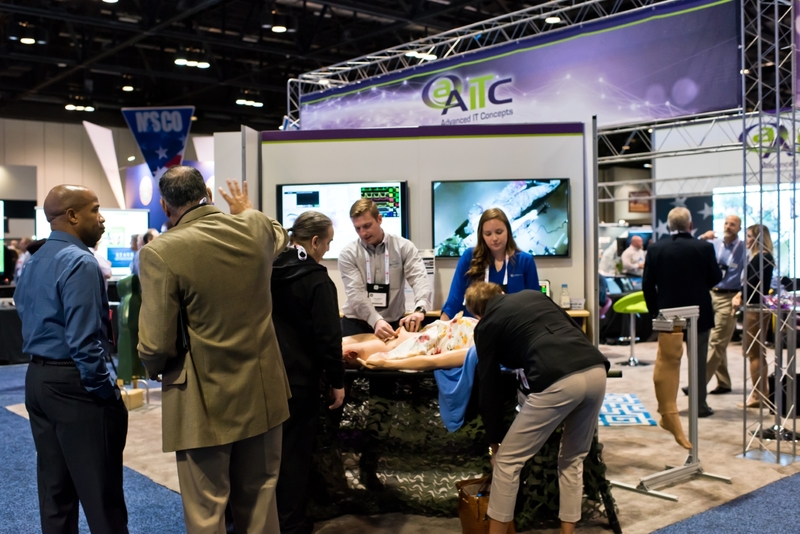 Not presented at I/ITSEC, but another part task trainer available from SIMETRI is the humeral head intraosseous (IO) trainer, which is a trainer for inserting a needle into the humerus bone for IO infusion into the bone marrow. This type of injection is performed on a patient when intravenous (IV) methods can’t be used. The humeral head is the more rounded part of the upper arm bone which inserts into the shoulder. With this procedure, the patient’s arm is rotated so that the humerus is in the right position for the needle injection. Most trainers have only a removable patch of skin to expose the humerus to see if the insertion was done correctly. SIMETRI’s trainer also has that removable patch of skin, but it also allows surgical students to position a manikin torso with a rotatable arm, simulating how the injection would occur with an actual patient. Instructors can also use this trainer to demonstrate how to correctly position the arm for an IO insertion. As a systems integrator, AITC can connect customers with SIMETRI’s medical training solutions such as the park task trainers. Together we provide systems engineering and integration services and other professional services such as supply chain management, iterative prototyping and development, and systems engineering. “It’s a win-win for both of us,” said Angela Albán, President and CEO of SIMETRI. “AITC helps us to expand our portfolio, and SIMETRI helps to expand AITC’s. Our partnership is based on a friendship, with a desire to collaborate and find work together.” “By teaming up together, AITC and SIMETRI can use their unique capabilities to bring tailored solutions for their customers,” says Dave Balleweg, AITC’s Director of Sales and Marketing. To learn more about how AITC can create end-to-end IT solutions for your organization, please contact Lydia Perez in our sales department at sales@aitcinc.com.